Treats for Baby Tuesday: Gymboree, Old Navy, Carter’s + More! Save 25% off everything at Gymboree.com right now! No promo code is needed, just shop and complete your order. Make those baby books! Save 30% on any items in the Scrapbook Gifts collection with this Barnes & Noble printable coupon. Get an Old Navy printable coupon to save 20% on a single item in stores. Save $10/$50 or more in stores with this Party City printable coupon. Save 20%/$40 or more in-store purchases when you use a Carter’s printable coupon. Jumbo packs of all Pampers are $9.49 ea. Refill packs of CVS Soft Cloths Bab Wipes are $4.99 ea. Select tubs of Enfamil and Gerber Good Start Infant Formulas are $22.99 ea. Save $3.25/2 Tubs of Good Start or $5 on Enfamil formula. Jumbo packs of Huggies Diapers, Training Pants and Overnights are $9.99 ea. Tubs of Huggies Wipes are $2.99 ea. Jumbo packs of Tugaboos Diapers are B1G1 50% off.. Submit for a $3 Single Check Rebate to get your final price down. Rite Aid baby care items are B1G1 50% off. See your ad for more details. Jumbo packs of Huggies Diapers, Training Pants and Overnights are $9.49 ea. Select value packs of Pampers are $29.99 ea. B2G1 FREE $10 Target gift card at checkout. Select value packs of Huggies Diapers are $27.99. B2G1 FREE $10 Target gift card at checkout. Big packs of Huggies Pure & Natural Diapers are $19.79 ea. Refill packs of Huggies and Pampers wipes are $5.99 ea. Save 10% on all Up & Up Baby Food including pouches. Johnson’s Natural baby items are all 10% off. Use one of these Johnson’s Baby printable coupons to save $1 off one. All Aveeno Baby Organic Harvest items are $9.99 ea. 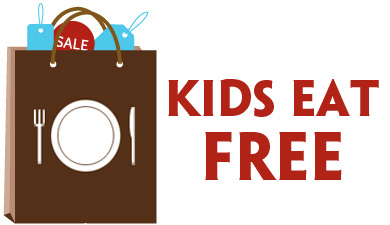 Treats for Baby Tuesday: Barnes & Noble, Little Tikes + More! Save 15% on any one item at Barnes & Noble with this printable coupon. 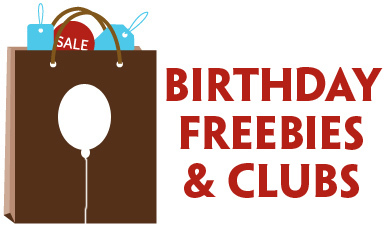 Enroll in The Children’s Place Birthday Club and get coupons and extra savings for both yours and your child’s birthday! This Old Navy printable coupon will save you 20% on a single item in stores! H&M has adorable clothes for kids and babies! Use this 20% H&M printable coupon to save on one item in stores. Use this Little Tikes printable coupon to save $5 on a Little Tikes Playhouse or TikeStix. Big packs of Huggies Diapers are $19.99 ea. B1G$1 in ExtraCare Bucks at checkout. CVS-brand Supreme Diapers and/or Training Pants are B1G1 50% off. Select Johnson’s Baby products and Desitin are $2.99 ea. Use one or more of these Johnson’s printable coupons to save even more! Super packs of Pampers Diapers are $24.99 ea. B1G$3 in +UP Rewards at checkout. Refill packs of Pampers Baby Wipes are $6.99. Jumbo packs of Tugaboos Diapers are 2/$15. Submit for a $3 Single Check Rebate to get your final price down to $12/2 jumbo packs of diapers. 360-ct. pks. of Tugaboos Wipes are $8.99. Spend $25 on Johnson’s Baby items and receive $5 in +UP Rewards. Use these Johnson’s printable coupons to save even more! Jumbo packs of Huggies Diapers, Training Pants and Overnights are $9.49 ea. Get $3 in RRs when you spend $15, or get $5 in RRs when you spend $20 on these and other Kotex items. Select tubs of Enfamil Formula are $22.99 ea. Use the $5/Enfamil baby formula coupon to get it for $17.99! Aveeno Baby Care items are B1G1 50% off. Jumbo packs of Pampers Diapers are 2/$18. Jumbo packs of Huggies Diapers are 2/$18. Select Johnson’s Baby and Desitin items are on sale for as low as $3 ea. Use one or more of the Johnson’s printable coupons to save even more! Giant packs of Huggies are $34.99 ea. Treats for Baby Tuesday: Picture People, Macy’s + More! Use this Picture People printable coupon to get a 25 print photo package for just $18. 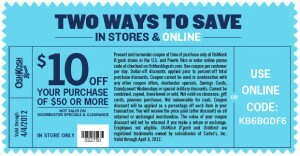 This Carter’s printable coupon will save you 20% on in-store purchases of $40 or more. Print out a Macy’s printable coupon and use it in stores to save an extra 15% on select sale and clearance items for kids, men and women. Use this OshKosh B’Gosh printable coupon to save 20%/$40 or more in stores. Jumbo packs of Huggies Diapers are $9.49 ea. Spend $30 on these and other items in the weekly flyer and you’ll receive a FREE 18 pk. of Cottonelle Toilet Paper. CVS-brand Soft Cloths Baby Wipes are B2G1 FREE. Family packs of Luvs Diapers are $16.99 ea. B1G$2 in +UP Rewards at checkout. Pampers Baby Wipes are B1G1 50% off. Jumbo packs of Tugaboos Diapers are 2/$15. B2G$2 in +UP Rewards. You can also submit for a $3 Single Check Rebate to get your final price down to $10/2 jumbo packs of diapers! Jumbo packs of Walgreens Premium Diapers, Training Pants or Overnights are $5.99 ea. Super packs of Pampers Cruisers Diapers are $24.99 ea. Select tubs of Similac Infant Formula are $24.99. B1G$2 in Register Rewards at checkout. Tubs of Walgreens Baby Wipes are $1.99 ea. Economy packs of Pampers and Huggies are $37.99 ea. B2G1 $10 Target gift card FREE at checkout! Treats for Baby Tuesday: OshKosh B’Gosh, Carter’s + More! Use these JCPenney Portrait Studio coupons to get a FREE8x10 or a portrait package for $20! This coupon for The Children’s Place will save you 15% on your entire in-store purchase. Shop at Carter’s stores and use this Carter’s printable coupon to save $10 on orders of $50 or more. The latest Babies R Us flyer is available. While one bonus deal is only available through 4/3/12, the other listed bargains are valid through 4/7/12 or 4/12/12. 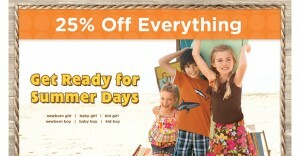 Save $10/$50 in stores when you use the OshKosh B’Gosh printable coupon. Refill packs of Pampers Sensitive Wipes are $5.99. Select tubs of Enfamil Baby Formula are $22.99 ea. Use this $5 off Enfamil printable coupon to get your tub of formula for $17.99. Select Johnson’s Baby and Desitin products are on sale for $5.49. Use one or more of these Johnson’s Baby or Desitin printable coupons to save even more! Jumbo packs of Pampers Diapers and Training Pants are $10 ea. Spend $25 on these and other select P&G items and get $5 in +UP Rewards at checkout. Refill packs of Tugaboos Baby Wipes are 2/$12. Spend $30 on these and other select RA products and get $10 in +UP Rewards. Select Rite Aid baby care items are 2/$5. Spend $30 on these and other select RA products and get $10 in +UP Rewards. Jumbo packs of Tugaboos Diapers are 2/$15. Spend $30 on these and other select RA products and get $10 in +UP Rewards. Jumbo packs of Tugaboos Training Pants and Overnights are 2/$16. Spend $30 on these and other select RA products and get $10 in +UP Rewards. Tugaboos infant formula is priced from $15.99-$18.99. Spend $30 on these and other select RA products and get $10 in +UP Rewards. Jumbo packs of Pampers Diapers, Training Pants and Overnights are 2/$20. Pampers wipes tubs are $2.50 each. Select tubs of Similac, Enfamil and Gerber Good Start Baby Formulas are $22.99 ea. Use this Enfamil printable coupon to save $5 more! Big packs of Huggies and Pampers Diapers are $19.79 ea. B2G$5 Target gift card at checkout. Value packs of Huggies and Pampers Wipes are $10.99 ea. Small cans of both Enfamil and Similac baby formulas are $13.99 ea. 2-packs of Gerber Baby Foods are on sale 10/$9. Treats for Baby Tuesday: Barnes & Noble, H&M, Hasbro & Playskool + More! The newest Babies R Us coupons are available. See all the specials, including major savings on AngelCare Baby Monitors, Johnson’s Gift Sets, baby formula and more! Use this Barnes & Noble printable coupon to save 30% in stores on the adorable Peter Rabbit collection. This H&M printable coupon will save you 20% on your entire in-store H&M Kids purchase. Check out Old Navy’s Facebook page and find a printable coupon to save $15 on a store purchase of $75 or more. Save over $100 on toys and games with these Hasbro and Playskool printable coupons! Big packs of Huggies Diapers are $19.99 ea. Refill packs of Huggies Baby Wipes are $5.99 ea. Huggies Little Swimmers or Pampers Splashers Swim Diapers are B1G1 50% off. 6-packs of Pediasure are 2/$20. B2G$2 in ExtraCare Bucks at checkout. Sign up for the Pediasure newsletter and get a $3/1 Pediasure Product coupon. If you can print two coupons you’ll get 2/$12 after coupons and ECBs! Value boxes of Pampers Diapers are $29.99 each. B1G$5 in +UP Rewards. Buy $40 in select Kimberly-Clark products and get $10 in +UP Rewards. This includes jumbo packs of Huggies Diapers, Overnights, Training Pants or value packs of Wipes for $10. Jumbo packs of W Baby Care (Walgreens brand) Premium Diapers are 2/$10. Refill packs of W Baby Care Baby Wipes are 2/$10. Big packs of Luvs Diapers are $17.99 ea. Buy 2 and get a $2G$5 Target gift card at checkout.